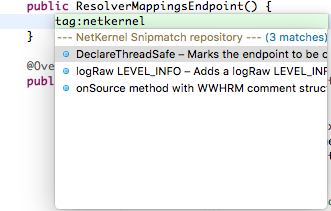 If you are using the Eclipse IDE for NetKernel development, you can make use of the built-in Code Recommender Snipmatch snippets feature, plus this NetKernel snippets repository to get a helping hand with inserting common xml and java fragments. Full details on how to set up your Eclipse workspace to access the NetKernel snippets repo are given in the repo’s README on GitHub. Once set up, just place your cursor in the xml or java file where you want to insert the snippet, press Ctrl + Alt + Space then start typing a snippet name (or type tag:netkernel) to see all of the available snippets that are appropriate for the type of file you are currently editing.